1. The 70-80HP 4-wheel drive orchard tractor is specially designed in compact structure, characterized by light weight, small wheel track, and mid-mounted anti-tilt stand. 2. Coming with 4-cylinder diesel engine produced from UK Ricado technology, our four-wheel tractor has large torque, strong overloading capacity, and low fuel consumption. 3. The transmission system adopts European technology. It uses sliding sleeve gear shifting and 12F+4R gear position. 4. Durable and reliable, the front axle uses technology from Europe. 5. Our 4-wheel drive orchard tractor has two independently controlled clutches, which makes it possible for normal driving during gear shifting. In addition to the high reliability, the working efficiency is improved, accordingly. 6. 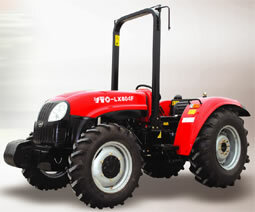 The agricultural tractor is engineered with hydraulic steering system, resulting in easy manual operation. 7. For safe and reliable operation, our farm machinery is installed with hydraulic wet disc brake. 8. In order to use in conjunction with a variety of farm implements, the farm tractor comes with double-speed PTO shaft, and two multi-way valves. 9. This 4-wheel drive orchard tractor is installed with rear three-point suspension I. The quick trailer connecting device is optional.